Merry Christmas Eve! Well the time is almost here – Christmas Day is tomorrow! I hope that you are all having a great weekend. I went to the gym this morning, ran a few errands, did some cleaning and cooking, and now I’m sitting down to write this blog! It’s been a busy day, actually a busy week, but I’m looking forward to a fun day tomorrow filled with the 3 Fs – family, friends and food! In case you missed my post earlier this week, I finally selected my spring marathon. I’ll be running the Shamrock Marathon in Virginia Beach on March 18. Training officially starts tomorrow! This was my last week of pre-marathon training and it went really well! Class was awesome as always. I was a hot sweaty mess by the end of it. Earlier that day I went for a nice walk during lunch. I’m going to try to do this twice a week so I can get away from my desk! I did my long run today because I knew that Saturday would be pretty busy. This was my longest run since early October but it went pretty well. We worked a lot with the benches during class which was different but really good. This run was a little bit of a struggle but I got it done! No workout but I did get my welcome package from Health Warrior. I’m psyched to be a part of the tribe next year as I love their products. They make awesome snacks for me throughout the work day! I think everyone in the tri-state area had to move their run to the treadmill on Saturday. Rain + cold temperatures = horrible running conditions. I didn’t want to risk running in that weather and possibly getting sick before Christmas or slipping on the ice. The treadmill worked just fine for my 6 miles! I decided to wear #allthegreen for a class on Christmas Eve because why not?! I feel like this was a great week of pre-training before the real thing starts tomorrow! I’m super excited to start another training cycle. It’s going to be a shorter training cycle at only 12 weeks, but I feel like I have a good base going into everything. If you have run Shamrock before, or have heard anything about the race, I welcome any feedback! How was your week? Are you ready for the holiday? We just moved our long run from yesterday to today (lots of ice; still icy patches). Sounds like you had a great week & great job on that first double digit run! Have a very Merry Christmas, Kim. The ice was really crazy – the main roads were fine but I heard the sidewalks weren’t that great. Wishing you a very merry Christmas Judy! This reminds me I still need to try those bars! Great week of training… I think you have a great base for a 12 week plan! You will love Health Warrior bars! Thanks so much Vicki – I’m hoping 12 weeks will be enough time to get me the PR I have wanted for over a year! Yes, ready for Christmas…just got my ham balls made and I’ll bake them in the early morning (while I’m running) and then put them in the crock pot…and make my potatoes 😉 Merry Christmas!! I hope that you had a great Christmas Kim! 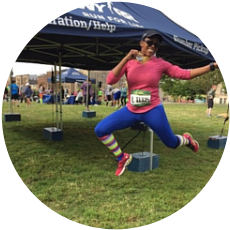 Congrats on being a tribe for Health Warrior! I have tried their products and like them too. I am looking forward to your Shamrock Marathon training!! Wow, good luck with your new training plan! I usually need a recovery day from the holiday! I love your Wednesday workout leggings! Merry Christmas! Hope you’re having a fabulous Christmas, too! Great job keeping with your running. I need to do more workday walks to get out of the office for a bit. Good luck with your next training program! Thanks so much Clarinda! I’m keeping my fingers crossed for a great training cycle. Dang, what a great week of workouts …you certainly didn’t let the hustle and bustle of the holidays get in your way!! Congratulations on choosing your spring marathon and good luck!! Thanks Teresa! I really tried to stick to a workout schedule since I knew I was starting training this week! I hope you and your family had a wonderful Christmas. I look forward to following along on your Shamrock training cycle! Way to keep up with your workouts! I did too, but didn’t have time to do a Weekly Wrap. I’m excited to follow you as you train for Shamrock! Saturday was such an awful day for running outside! I was glad I got my long run done on Friday. Great job getting in all those workouts! You were so smart to get it done on Friday. I’m thinking that I will have to do the same thing this week as we’re expecting snow on Saturday again.